Milan is the industrial powerhouse of Italy, drawing a mix of international businessmen, fashion designers, media moguls, and tourists by the busload. 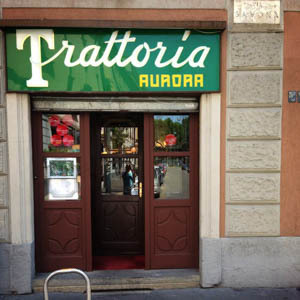 Milan's industry has also long been a major draw for inter-Italian emigration, so it's no surprise that Milanese restaurants serve a medley of cuisine from across Italy's regions: Apulia's sun-drenched Mediterranean south, Tuscany's vine-draped arcadia in the heartland, Gallic Piemonte hard up against the French Alps. The hand-printed daily menu is pure cucina casalinga (home cooking)—nothing fancy, and plenty of dishes that local mammas invented long ago to make use of the cheapest cuts of meat: insalata di nervetti con cipolle (a cold salad of pickled cow tendons tossed with onions), lingua salmistrata (tongue stew), cuore trifolato (heart casserole). Don't worry, there are plenty of less adventurous choices as well. Marco Ferri packs his guests in elbow to elbow, fitting a trio of lunching businessmen, a young couple, and a lone traveler at a single table set with butcher paper place mats and a single, dime-store glass at each place. The set-priced menu is, hands-down, the best deal in all of Milan. For less than $40 you get the proverbial soup-to-nuts, wine and water included, starting with a flute of spumanti and a selection of amuse-bouches—tiny sweet-and-soup pickled onions, bell pepper confit, crostini topped with a florette of whipped herbal cheese, wedges of roasted red pepper cupping a dollop of pureed olives, slivers of tender veal swimming in a caper-studded cream sauce, and a pile of delicate lardo (basically the cured fat trimmings from prosciutto). All that before you even start in on the meal itself! 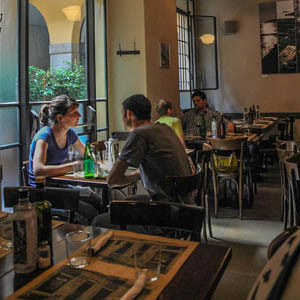 About a 10-minute walk southeast of Piazza Duomo (Via C. Corenti is an extension of Via Torino, one of the major avenues fanning out from the square), this busy creperie is an ideal stop for a light lunch or a snack while visiting the nearby church of Sant'Ambrogio or Museo Nazionale di Scienza e di Tecnica. The far-ranging offerings include prosciutto e formaggio (ham and cheese), or of the dessert variety (the Nutella, with the creamy chocolate spread, is highly recommended). There are a few value menus: Before 3pm you can get one non-dessert crepe, plus one sweet one and a drink, for 5[eu] ($6); until 9pm you can get two "salty" ones, one dessert crepe, and a drink for 7.50[eu] ($9). Giuseppe and Antonella Villa preside with a watchful eye over the centuries-old premises (a restaurant since 1933), tucked into a narrow lane in one of the oldest sections of Milan, just west of the Duomo. 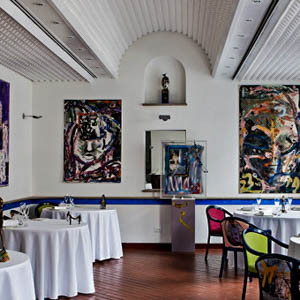 In the three-beamed dining room, Milanese families and other patrons share the long, crowded tables. 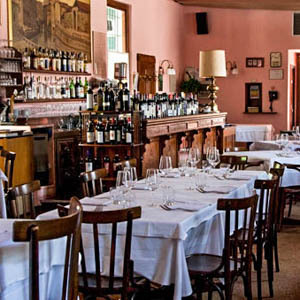 Giuseppe, in the kitchen, prepares what many patrons consider to be some of the city's best traditional fare. 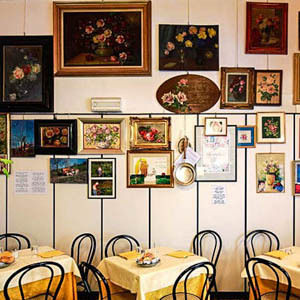 Since it's only steps from Santa Maria delle Grazie, you can enjoy the old-world ambience and a cup of excellent coffee (or one of the many teas and herbal infusions) as you dash off postcards of The Last Supper. Of course, you'll want to accompany your beverage with one of the elegant pastries, perhaps a slice of the panettone (cake laden with raisins and candied citron) that’s a hallmark of Milan. No one prepares it better than they do at Marches. Still, most restaurants are built atop a solid foundation of typical Milanese dishes and the cuisine popular in surrounding Lombardy, where the breadbasket plains of the wide Po Valley wash up against the lower slopes of the Alps in Italy's lake district. Lombardy's cooking mixes of lake and river fish, mountain cheeses, and the legacy of the barbarian hordes who settled here after the 5th-century fall of Rome. The Lombards are descended from Germanic, not Latin, stock, so it's no surprise the local signature dish is cotoletta alla milanese, that flattened, breaded veal cutlet more commonly known as wienerschnitzle. Want a free dinner in Milan—or at least a hearty snack to stave off hunger until dinner? Do a stuzzichini (snacks) crawl from bar to cafe during the aperitivo /Happy Hour for tons of free bar snacks and scrumptious canapés. » more Saffron-tinged risotto alla milanese is made with small, pearly grains of arborio rice, slow-cooked in broth to sticky perfection. Often, a bright yellow dollop of this rice appears on the plate next to a hearty slab of ossobuco, a beef shank served with the circle of marrow-rich bone still imbedded in the meat. Tortelli di zucca, the pasta pockets stuffed with a spiced pumpkin paste typical of nearby Mantova, often show up on Milanese menus. Cassoeûla is, as it sounds, a Milanese version of cassoulet, a stew-thick, cabbage-based soup fortified with meaty chunks of pork chop and sausage. Many meals feature Northern Italy's signature side dish, polenta, a cornmeal mush that can range from a runny soup to a spackle-thick paste, sometimes cut into bars and lightly fried, sometimes studded with bits of mushroom or other fresh ingredients. 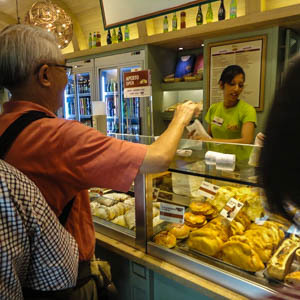 There's an unavoidable charge called pane e coperto ("bread and cover") of about €1 to €5 that's added onto your bill at just about all Florentine restaurants. This is not a scam. This is standard in Italy. With the famed Italian lakes (Como, Garda, Maggiore, and many smaller ones) reaching their deep fingers of water into the Alps just north of Milan, and the Mincio River lying to the east, Milan's restaurants are spoilt for fresh fish. To increase the likelihood that you're getting local products, look for the following fishies: persico (perch), trota (trout), lavarevllo and coregone (both forms of whitefish from the lakes), luccio (pike), or tinca (tench). Lombardy is the proud home of pungent, blue-veined Gorgonzola cheese, as well as its less famous—but just as wonderfully stinky—cousin from nearby Bergamo, the gooey, mold-less taleggio. Grana padana is the local sharp, hard, aged cheese that can hold its own against any parmesan or pecorino romano. Lombardy also produces the widely exported Bel Paese (the sort of mild, everyman cheese you could throw into a kid's lunch box) as well as marscarpone, so soupy and spreadable that many people mistake it for some kind of heavy cream (understandable, as it's the prime ingredient in such heavenly, creamy desserts as zuppa inglese and tiramisù). Speaking of dessert, Milan may not win too many awards in this department, and the sweets on its menus tend to hail from other parts of Italy, but we can blame the locals for having invented panettone, a sweet bread studded with bits of candied fruit—the traditional Christmastime dessert (though in its defense, panettone is far, far more palatable than its fruitcake cousins around the world).